What do you normally do when you have a toothache? Most people typically take some type of medicine that was purchased at the store. When you are away from home or want relief right away, then you need an ideal solution. 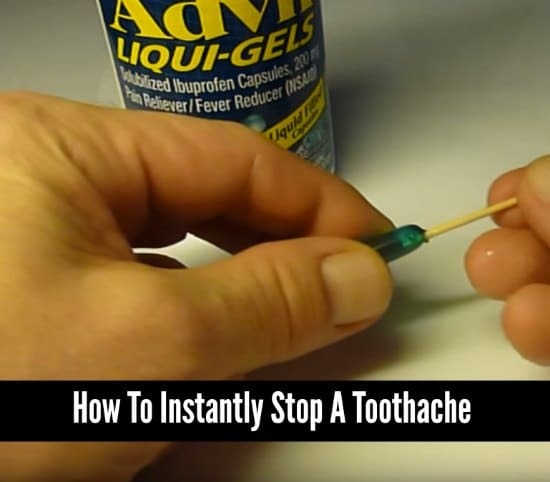 You are in luck, becuase there is a way to instantly stop a toothache. The key to being able to instantly stop a toothache is using Advil Liqui-Gels. You could also use an off brand too, but the results may not be the same. A knife or tool with a sharp tip will also be needed. You will also need a toothpick. Poke a hole into one end of a Liqui-Gel capsule with a knife of other tool and insert the toothpick. This will plug the hole so you can apply more medication later. Apply a bit of the liquid medicine on a piece of paper towel and bite to instantly stop a toothache. Be sure to watch the entire video below to be aware of possible chemical burns when using this method.